A comment on When styles collide raises the interesting question of when was the Matthew Passion composed? Was it when Bach started writing the work, when he finished it, or when he produced his final performing version? It is much more than a semantic point. Behind it lies the question, what is the Matthew Passion, or any other piece of music? Is the Matthew Passion the notes printed in the score? But there are diffferent performing editions, and Bach himself directed several versions. Is the Matthew Passion the music Bach heard in his head when he was writing it? But his conception of the work continued to evolve and he was still revising it nine years after the first performance. Is the Matthew Passion the music we hear in performance or from a recording? But performing styles, musical competencies, acoustics, recording technology and our own auditory and receptor systems are constantly changing. Most of us see ourselves as corks floating in a stream, persisting things moving along in the stream of time ... The fact is, however, that there are no corks in the stream. There is only one stream. What we conceptualize as "cork" is also stream. We are like music. Music, after all, is a type of stream. Music exists only in constant flow and flux and change. Once the movement stops, the music is no more. It exists not as a particular thing, but as pure coming and going with no thing that comes and goes. Each movement is virgin, even the repeated one - you can't repeat anything exactly - even yourself! Which means none of us hear the Matthew Passion the same way, and none of us hear the same Matthew Passion twice. Most importantly, it means there is no permanence in music. Comparisons require permanence. So our endless search for the newest, most authentic, best performed, award winning and best recorded version of a work is meaningless. The only Matthew Passion is the one you are hearing right now. Savour it, because it will never sound the same again. 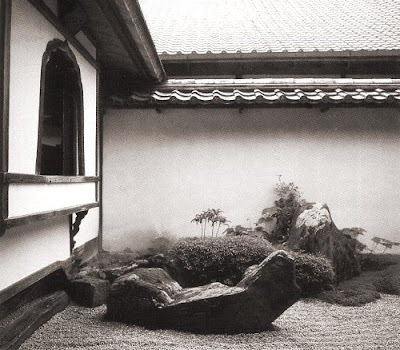 Header image is a CD of contemporary music by John Palmer who spent time in a Zen monastery in Kyoto. 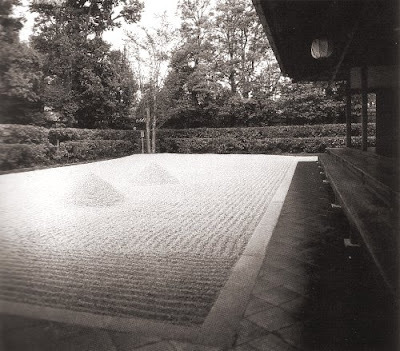 Lower two photos are of Daisen-in, the Great Hermit Temple in Kyoto, which I visited during my first trip to Japan in 1983. 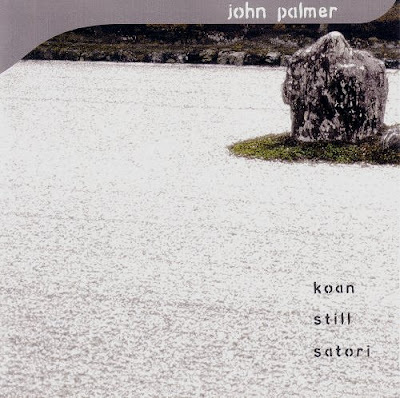 Read more about John Palmer's music, and about koans, here. This post, "Music exists . . ", is why I follow your blog. You keep looking at things most people simply accept. As I said earlier, I spend a lot of time thinking about music, but don't have many folks to talk to about it. My intuition tells me that processing what you're getting at here is really going to help me better understand the nature of music and music making. Being verbal about the nonverbal is tough, but not impossible if we can rethink perceptual categories. The better I can understand music and music making, the better I can figure out how to use it to help people. As of now, nothing to add to what you're saying, just had to write in with a note of appreciation and thanks. This post has induced a number of memories and associations for me. Your using Buddhist thought to talk about music reminded me of my first encounter with Tibetan Buddhism, when I was struck by the frequent use of the phrase "spiritual practice". Up until then I'd largely associated the word "practice" with just musicians, athletic teams, doctors and lawyers. Ever since then the notions of practicing music and spiritual practice have been intertwined in my mind. With each you're using daily encounters with an essentially nonverbal experience, trying to better understand it and to use what it offers to better your life experience. The point you make about music's being able to exist in the mind even when you're not actually listening to a live performance ties in with a lot of the new brain research. A lot of the same places in the brain light up in imaging studies both when you're hearing live music and when you're not, but just mentally listening to or performing a piece. Since we all have brains that are wired differently because of both genetics and our individual past experiences, we all respond differently to various pieces of music, as well as to various performances of a single piece. So besides there being no permanence to a piece of music, there's no permanence in the minds making the comparisons, either from person to person, or the same person at different times in different moods. That Steve Hagen quote is wonderful, and led me to the notion that maybe the deep reason music can have such great effect on us is that the flux and flow of one can connect with the flux and flow of the other, that there's a sharing of the ways of working between streams of music and our streams of consciousness.